A Heartless that doesn't stop moving. It unleashes spinning attacks and powerful lightning attacks on its enemy. It is immune to lightning. The Reckless (レックレス, Rekkuresu?) is an Emblem Heartless and a variation of the Devastator Heartless only found in Kingdom Hearts II Final Mix. They appear specifically in the Engine Chamber. 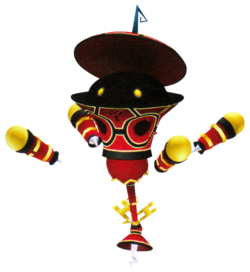 The Reckless is a mechanical Heartless that seems to have a large, spherical, black head with glowing yellow eyes encased in a funnel-shaped suit of armor. It has a flat helmet with a jagged, black antenna on its top. At the base of the funnel is a large turret with a yellow shaft and a black tip. Three red, H-shaped pieces float around the tip of the cannon. It also has four cylindrical "legs". None of these legs are directly connected to the Heartless, and instead levitate around it. The Heartless has two forms. One is a tank-like, ground-based one in which it walks along the ground using its legs for locomotion and its turret for attack. The other is a levitating, aerial one that uses its legs to bludgeon opponents and seems to use its turret to remain floating. The Reckless is predominantly black and covered in red and yellow computer circuitry. Its Heartless emblem is on its front, just under the rim of the funnel. "Reckless" means "headstrong" or "without care."